If you’re African American, you know that your hair not only looks different than European-American hair, it has different issues. And perhaps the number one issue is breakage. Why is this happening? African-American hair is usually coarse and porous, with a raised cuticle layer that easily absorbs and loses moisture. Often this results in dry, brittle hair. Now consider some of the popular styling methods for African American hair. Harsh chemicals weaken hair, leading to breakage. Both relaxers and soft-curl perms are culprits here. Heat styling is also especially hard on African American hair. 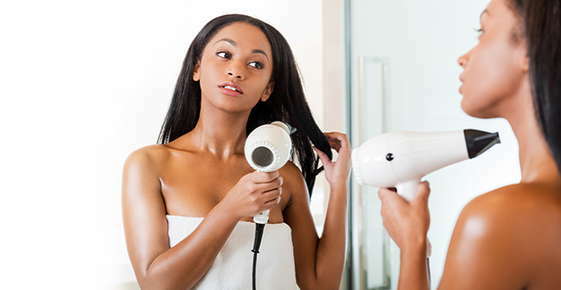 Did you know that flat-irons, curling irons and straightening combs can be 400 degrees or hotter? Goodbye moisture, hello breakage! Nor does coloring contribute to hair health. Most African American hair is naturally black. This means any color change requires bleach, which is not a friend to anybody’s hair. No, we’re not asking you to give up style, though if you say the word “blonde,” we might remind you that black is beautiful, and bleachy breakage is not. Here are a few ideas for going a little easier on your hair. Think gentle. Gentle shampoo, gentle conditioner with lots of moisture. Add some oil or other deep-conditioning treatment each week. While European hair is prone to a case of the greasies, African American hair loves moisture-sealing oil. Take a tip from the ancient Egyptians, who were oiling their black hair three thousand years ago. Trim dry and brittle ends, before they travel up your hair shaft as split ends. You can comb your hair while it’s saturated with conditioner, but no brushes until it dries. Leave chemicals to the experts. Your stylist is trained in best practices. Home experimentation is rarely a good idea. Dial back the heat. Try other styling methods, such as wet sets. Break out the flat iron for special occasions only. Need some more guidance? Don’t know how to style without heat? Want to find a good everyday style that doesn’t lead to breakage? We’re here for you. Call us today to discuss the best ways to keep your hair healthy and stylish.